I absolutely crave this cuff. 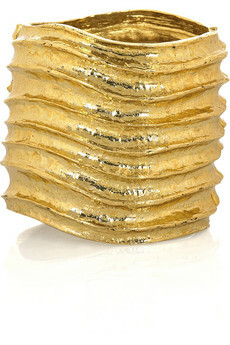 It’s the most beautiful cuff I’ve seen in a long time and it must be mine. I love the design and the look. And again, I love what Net-a-Porterhas paired it with. With summer around the corner, this is the perfect accessory to wear with the lighter, more fun outfits in the warm weather. I’m not in love with the $345 price tag particularly since it’s actually gold-plated brass but for Oscar de le Renta it’s not horrible. And it’s the type of piece that will always be in style. So, I can consider it an investment right?